Finance Minister Arun Jaitley said on Wednesday that the government was hoping to implement the Goods and Services Tax (GST) by July 1 after the enabling Bills get Parliament's nod in the current budget session. "GST is the biggest reform in India. Hopefully, GST will be implemented by July 1. 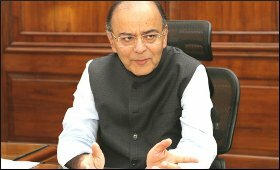 GST Bills will hopefully be cleared in Parliament," Jaitley said here at the 23rd Conference of Auditors General of Commonwealth Nations hosted by the Comptroller and Auditor General (CAG) of India. Jaitley said that India's indirect taxation regime, which is currently the most complex in the world, will transform into a simplified one with the implementation of GST. "We have the most complicated indirect tax systems. Once implemented, what is currently the most complicated system in the world will become the simplest in the world. The enabling laws are before the Parliament. By middle of the year (2017), we hope to see the implementation of GST," he said. "Evasion of taxes will be difficult under GST. Size of Indian economy will increase," he added. Jaitley also noted that India is an open economy with 90 per cent of the investment happening through the automatic route. "Opposition to reforms is minimal. Opposition to protectionism is minimal. Reforms in the foreign direct investment (FDI) in India have been significant and we are among the most open economies in the world," he said. The Finance Minister, however, lamented that while public investment and FDI were high, private sector investment still lagged behind.